Immediately following the news that sales of antibiotics to treat and prevent disease in UK farm livestock have achieved a record low (27% reduction over the past two years) targets for further reducing, refining or replacing antibiotic use across the key livestock sectors have been announced at a London conference today. Sector-specific targets have been developed over the past year by a ‘Targets Task Force’, facilitated by the Responsible Use of Medicines in Agriculture (RUMA) Alliance, to ensure that agriculture can also contribute to reduction in antibiotic use in industry. The Targets Task Force comprises a leading veterinary surgeon and farmer from each of the beef, dairy, egg, fish, gamebird, pig, poultry meat and sheep sectors, who have been consulting with key organisations in their respective industries. The group also includes observers from regulators, Food Standards Agency and Veterinary Medicines Directorate (VMD). 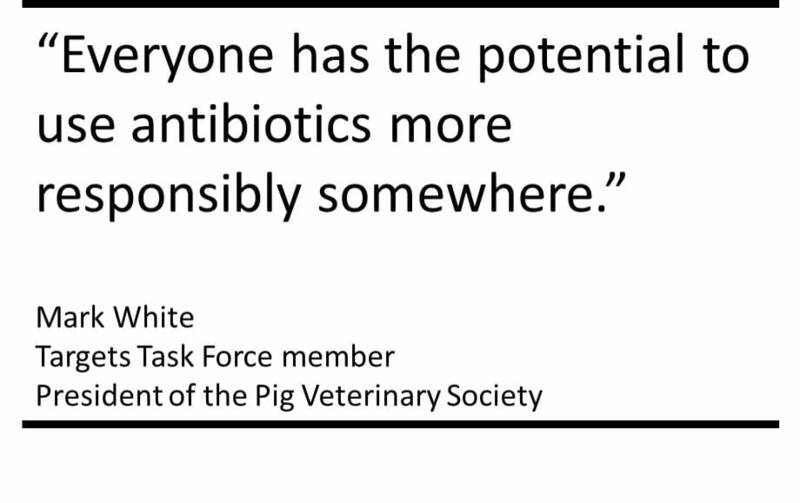 It is evident that the sector – steered mainly by the members of the Pig Veterinary Society, AHDB Pork and the National Pig Association – has the will and the capability to fully engage with the issue. We can also work to improve water delivery systems so that more targeted treatment in the water can be used instead of in-feed medication. Some of the strategies to achieve these goals in dairy farming include reducing the use of antibiotic dry cow therapy and injectable products, and cutting back on group treatments such as antibiotic footbaths for lameness (which remain largely unproven); instead opting for topical and targeted treatments. In doing this, the poultry meat sector has also ceased all preventative treatment and use of the highest priority CIAs. This sector will use clinical governance to ensure CIA antibiotics are only prescribed when absolutely needed and with sign off from veterinary specialists and management. In the sheep sector, we’re not high users of antibiotics. But we want to ensure that any use is totally targeted so we are challenging all inappropriate or routine preventative use. Convincing farmers to change practices is tricky, and none of us want to see an increase in levels of disease, but those who have had the courage to work with their vets to change what they do are now seeing what is possible. The answer is to take a holistic approach and work closely with a keen vet. The members have worked very hard and have shown incredible leadership and persistence. They have also provided unprecedented support and inspiration to each other. I am delighted they have agreed that the group should continue to meet twice-yearly to review progress and discuss issues. The full report with all targets for each sector can be downloaded from the RUMA website www.ruma.org.uk.